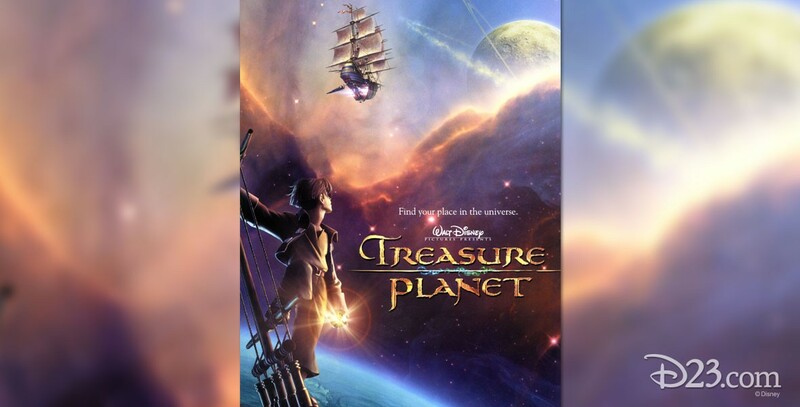 Treasure Planet (film) With a nod to Robert Louis Stevenson’s Treasure Island, this animated feature follows 15-year-old Jim Hawkins’s amazing journey across a fantasy universe as cabin boy aboard a glittering solar galleon, RLS Legacy. Befriended by the ship’s cyborg cook (part man, part machine) John Silver, Jim thrives under his guidance, showing the makings of a fine spacer. As the story unfolds, he and the all-alien crew battle supernovas, black holes, and ferocious space storms. But even greater dangers lie ahead when Jim discovers that his trusted mentor Silver is actually a scheming pirate with mutiny in mind. Confronted with a betrayal which cuts deep to his soul, Jim is transformed from boy to man as he finds the strength to face down the mutineers and discovers a “treasure” greater than he had ever imagined. Directed by John Musker and Ron Clements. Released on November 27, 2002, simultaneously in regular and large-screen theaters, after a world premiere on November 5 in Paris and a release beginning there November 6. Voices include Martin Short (B.E.N. ), David Hyde Pierce (Doctor Doppler), Emma Thompson (Captain Amelia), Joseph Gordon-Levitt (Jim), Brian Murray (John Silver), Michael Wincott (Scroop), Michael McShane (Hands), Roscoe Lee Browne (Mr. Arrow), Corey Burton (Onus), Tony Jay (Narrator), Austin Majors (young Jim), Patrick McGoohan (Billy Bones). 95 min. This was the first animated feature where the backgrounds were all painted in the computer. While most of the characters were drawn by hand, John Silver was a complicated blend of hand-drawn and computer animation. Nominated for an Academy Award for Best Animated Feature. Released on video in 2003.